When I first arrived here on Friday night, I thought just being in London and traveling around the city and seeing all the Olympic Venue signage and advertising made the Olympics seem so real. It kinda did – but after today – it’s even more real. Today started off with about 300 members of the Bellmedia (CTV/RDS/TSN/Sportsnet…) London based staff (there are about 800 more back in Canada) who will be creating the Olympic Broadcast. We gathered for a “this is going to be great – so tell great stories” meeting. The message and the videos we saw built a fire. Then – almost concurrently to that – my good friend Nathalie Cook had the opportunity to run with some real fire! – the Olympic Torch – here in London. I recall when I had the privilege of running with the Torch just outside of Toronto as it made its way across Canada to Vancouver/Whistler and it was pure joy. I’ve seen some pictures of Nat and it looks like she felt it too! Pride and joy – everything the Olympic Spirit is supposed to be. Then… (at the Olympics, almost all stories seem to start off great and carry on with an endless supply of “and then”s!!) … and then if got even better. As an accredited member of the media I, like the public, do not have access to the Olympic Village but today, the group of people at the Canadian Olympic Committee (COC) that I work with in Athlete Preparation department had me come in on a guest pass. I got to see the product of much of our last few years of planning. Inside an Olympic Village is a special place. Everyone who is living in this ‘town’ of 10,000 people is the best in their country at what they do and they all believe that they can be the best in the world. There is an energy you can feel – as if the air is electric with consequence, confidence and incredible focus. On a plot of land that is probably 2.5km square, you can find over 200 nations living in harmony. The buildings are draped with the flags of each nation and as you walk around it you feel like you are circumnavigating the globe. That always blows me away. The organizing committee, LOCOG, provides a Poly-clinic (healthcare), cafeteria, post office, bank, convenience store as well as a hair salon, dry cleaner, florist, games room and gym.It is a self-contained mini city that has everything that athletes from around the world could want. I ran into a number of Canadian athletes and was happy to chat with them. Everyone is setting into their new home away from home with all their great new HBC Olympic gear. The COC has customize the everything from the building that the Canadians are living in to their bedrooms and the gardens around them. The large statue of a moose that stands at their front entrance is something I’m familiar with! A moose like that first showed up with the Canadian team in Sydney 2000 and it was as popular then as it seems to be now. The moose won’t help the Canadian team win – but it does show them that people went to some effort to let them know that people think they are special and worthy of extra effort. From lounges, snack areas, to meeting rooms, gyms, medical and treatment areas to quiet recovery and wellness areas; I was so proud to see all the Canadian-only spaces that the COC has created. I’ve added some photos I took while I was in the Olympic Village to My Adventures album, and – in accordance with IOC policy ;-)– I did ask for the permission of the people in them so that I could share these pictures! There are only two things left to happen that will really take the Games up a ‘feels real’ notch again… the lighting of the caldron – and the beginning of competition. Let the Games begin! I love it. 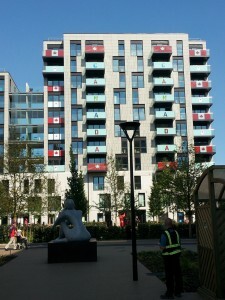 This entry was posted in Marnie's Adventures and tagged London 2012, Olympic Village, Olympics by Marnie. Bookmark the permalink.